Batman’s origin is always fertile ground in which to grow an intriguing story, and that’s where this episode takes us. It also weaves in some classic, mysterious supernatural figures from DC’s lore, and most importantly this episode was written by Paul Dini. Really guys, did you think you were just going to quietly slip in a Paul Dini story without anyone noticing? The title sequencee should have started with, “ LOOK! THIS EPISODE WAS WRITTEN BY PAUL DINI!” Of course Dini is the greatest writer of animated Batman tales ever, as well as great work writing for He-Man and The Masters of the Universe, Ewoks: The Animated Series and Days of Our Lives… well he’s written some good Batman Tales! Read on for more. The teaser features magical ne’er do well Abra Cadabra robbing a magician’s museum. 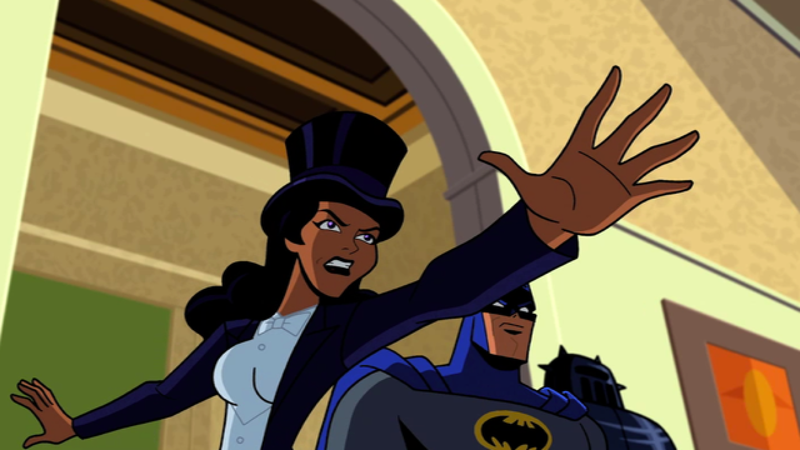 Of course Batman shows up to thwart him, but fortunately for the Dark Knight, magical lass Zatanna shows up to help. After an intense sorcerers duel, Zatanna breaks the malicious magician’s wand (not a euphemism folks) and defeats Abra Cadabra. Zatanna’s backwards magic works great on the page, where one can read the words she is speaking in reverse and understand the spells she is casting, but on the screen they just sound like unintelligable gibberish. I think the show’s creators could have figured out a better way to communicate Zatanna’s magical conceit without leaving viewers scratching their heads. I will say that it was a wise decision to tone down Zatanna’s costume for this sequence, because I’m not sure how well fishnet stockings and a bikini cut tuxedo fit this show’s aesthetic. The story proper starts with a flashback to the fateful night when Bruce Wayne’s parents died. First off, way to go for casting Adam West as the voice of Thomas Wayne. 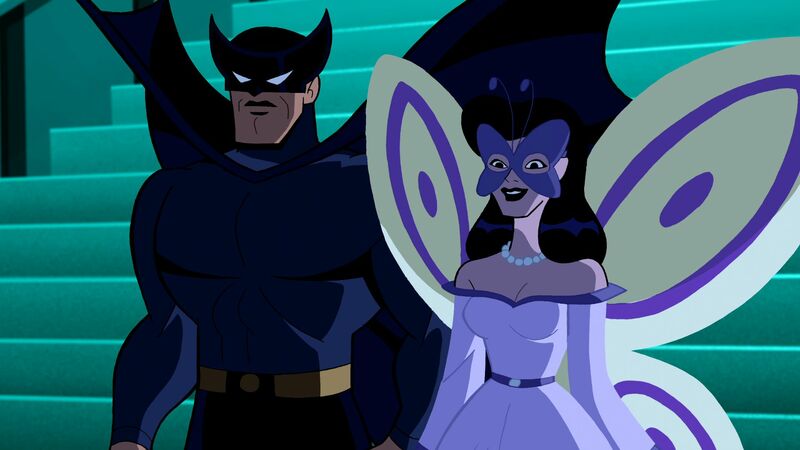 Bruce Conroy will always be the most beloved voice of the Bat (as well as the voice of the Phantom Stranger in this ep), but West will always be the most recognized and hearing it had me as giddy as a five year old on Christmas morning, oh and also – Julie Newmar was the voice of Martha. Back on topic, we get the classic alleyway confrontation resulting in the death of the senior Waynes, then we get a montage of young Bruce growing into Batman that fades into a scene with The Phantom Stranger who is joined by The Spectre. The Phantom Stranger is a great mysterious character from comics, that is in human form, though clearly not quite human and I like it when he is shrouded in mystery. The New 52 gave him a much more concrete origin story and mission that may work for some people, but I’ll just wait until it blows over and his origins return to vagueness before I dive into the character again. The Spectre is the Spirit of Vengeance for DC, making vengeance cool years before Ghostrider was a thing (I also want to point out that Mark Hamill is great as the Spectre in this story). The two ghosts are debating whether Batman should pursue justice or revenge, then set about trying to influence him in their own particular directions. Batman has used some subterfuge to determine the identity of his parents killer, Joe Chill and embarks on a journey to decide what to do with that information. Phantom Stranger pulls a ghost of Christmas past maneuver and takes Batman to a charity costume gala that his parents attended where his father was dressed as – big surprise – a bat. Some gangsters show up to steal the donations, and Thomas and Batman unite to repel them. This leads to the mob boss being put in prison, where he orders Joe Chill to assassinate the Waynes. As Batman is returned to the present, he is visited by Spectre and Bats assures him that vengeance will be served before the night is over. Batman locates Chill conducting an auction to sell stolen weapons to Gotham’s villains (Joker, Penguin, Poison Ivy, etc). 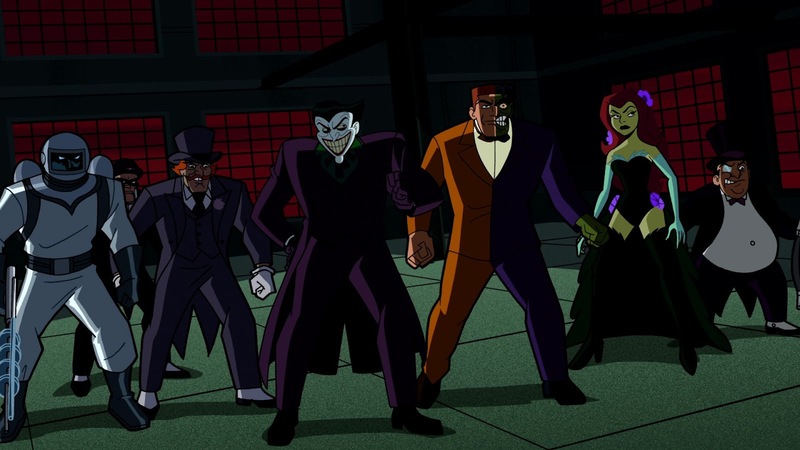 Through the course of ensuing events it is revealed to the group that Chill is responsible for the creation of Batman, causing the villains to turn against Chill. Finally, Batman has Chill in his grasp, and decides not to kill him. As Chill stumbles away from the merciful Bat, the ceiling collapses on him resulting in his demise. In the epilogue there is a glint in the Specter’s eyes strongly insinuating that he is the one ultimately responsible for Chill’s unfortunate end. The idea of villains turning against Chill is certainly not a novel one, and was recently revisited in the pages of Darkseid War, but it works really well here with the addition of Spectre and Phantom stranger as the Devil and Angel standing on Batman’s shoulders (metaphorically speaking of course, they didn’t actually draw them on his shoulders like that, though that would have been okay with me). 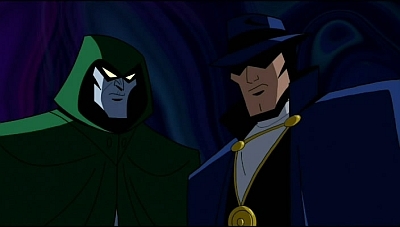 Some people lament unnecessarily retold origin stories in superhero media, and this is the second time that this origin has been visited in as many seasons of this series, but it worked really well here to forge a key change in Batman’s objectives as well as to nearly effortlessly help the viewer to understand the complex supernatural supporting characters that were featured. Adding the metaknowledge that this was written by Dini, I think this serves as an excellent continuity establishing moment that could serve as the point where Batman from the animated series transformed into the Brave and the Bold Batman. Well worth watching, particularly for fans of Batman: TAS.